Industrial portable ventilators, mobile fans, portable pressure blowers, commercial mobile ventilating fans and portable blowers. Sales of movable fans and portable blowers - New York Blower, Twin City, Northern Blower, Aerovent fans and ventilators, spark-resistant explosion-proof blowers and portable OEM fans. Axial fans in tubular housing commonly used in confined areas when fitted with flexible ducts, during painting, welding or chemical laboratory works. Engineering of Twin City Aerovent fans, CBC Chicago Blower fans, Acme fan ventilators, New York Blower, ILG American Coolair fans, fans for building ventilation, industrial high temperature oven fans, furnace blowers, leader ventilators, Delhi fans, negative pressure ventilators, USA industrial fas blowers, explosion proof pressure blowers, blower air knives, high temperature pressure blowers. Canada Blower Upblast Roof Ventilator is designed for heavy duty exhaust and well suited for continuous use. Each Upblast Roof Ventilator features a steel base plate welded to tubular steel struts to form a strong support for the motor and fan mounting base. All Upblast Roof Ventilators use statically and dynamically balanced airfoil fan propellers for optimal performance and longevity. The fan’s rolled steel circular windband cuts down on wind resistance and is easily removable for access to the motor and fan propeller. Fan flanges are integrally formed for increased strength. Upblast Roof Ventilator is constructed with close tolerances between the propeller tips and the exhaust orifice to take advantage of the propeller’s full area for maximum efficiency. Upblast Roof Ventilator also features a set of free action, positive force dampers as standard. Fan dampers open automatically when the fan turns on and close when the fan is not running. During blower operation, discharge velocity prevents rain or snow from entering the fan. Air dampers for Canada Blower Upblast Roof Ventilator ride on rust free bearings to reduce maintenance and increase life. L2 blade and L4 blade propellers are used throughout the size range in both direct drive and belted fan models. Direct Drive Upblast Rood Fan uses steel construction as standard. Hot dip galvanized, stainless or all aluminum construction is optional. All fans are cleaned, chemically pretreated using a phosphatizing process and painted inside and out with a light gray enamel finish. Belt driven Upblast Roof Fan uses the same steel construction, and is also available in hot dip galvanized, stainless and all aluminum fan construction. The Belted Roof Ventilator offers a more economical approach to a low-speed, quiet upblast roof ventilator for handling noncontaminated air. Since fan belts and sheaves are in the airstream, the ventilator should not be used to handle high temperature or corrosive air. 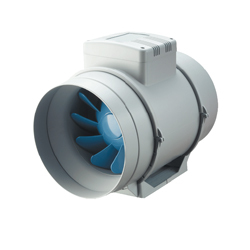 Drive selection for these fans carries a rating of from 1.3 to 2 times the normal satisfactory capacity. Canada Blower Hooded Roof Ventilators are high capacity, general supply or exhaust fans well suited to applications that require the quiet and efficient movement of large volumes of air in both commercial and industrial environments. Hooded Roof Ventilator is constructed of heavy-gauge steel panels, a steel base plate welded to tubular steel struts and a deep smooth orifice to allow for greater airflow efficiency. All Hooded Roof Ventilators use statically and dynamically balanced airfoil fan propellers for optimal blower performance and longevity. Sizes 24 thru 60 use a fan hood that is constructed of heavy gauge galvanized steel. Corrosion resistant fiberglass reinforced plastic hoods and other special materials are also available. Fan hoods are attached to the fan with heavy structural angle supports for added stability. The Hooded Roof Ventilator is constructed with close tolerances between the propeller tips and the exhaust orifice to take advantage of the propeller’s full area for maximum efficiency. Canada Blower Low Profile Upblast Propeller Roof Ventilators provide general exhaust of commercial and light industrial buildings while offering a pleasing low profile design that minimizes extension above the roof line. The upblast fan design discharges air and contaminants up and away from the building. These ventilators exhaust large volumes of air at low to medium static pressures. Typical applications for upblast propeller roof ventilators include warehouses, shopping centers and manufacturing facilities. A wide array of adjustable pitch, cast aluminum fan propellers are available to meet specific performances and ventilating application requirements. The cost effective design is available in both belt and direct drive configurations. Application flexibility, cost competitiveness and robust design all combine to make Low Profile Upblast Propeller Roof Ventilators an industry leader ventilating.com fanblower.com highpressureblower.net industrialblowerfan.com industrialfanblower.net industrialfanblower.com pressureblower.net northernindustrialsupplycompany.com industrialpressureblower.com tenderall.com chicagoblowercanada.com cbblower.com buffaloblower.com buffalofan.com nis-co.com canadianblower.com olegsystems.com canadablower.com abbblower.com acmefan.net industrialblower.net fansandblowers.net americanblower.net barryfan.com cincinnatifan.net canadafans.com barryfan.net pennbarry.net pennfan.net tcffan.com. Canada Blower is a world wide distributor of industrial process ans OEM fans and blowers, as well as fan / blower components; including high pressure blowers, high temperature fans, spark resistant and explosion proof ventilators, tubeaxial and vaneaxial high pressure ventilators. Canada Blower also does existing fans and blowers repairs, re-build, as well as dynamical wheels balancing.